This blog is focused specifically on original Izannah Walker dolls, not on reproduction or Izannah Walker inspired dolls. So why is this post about someone making Izannah Walker reproduction dolls? Because Kathy Patterson, known for making wonderful wooden reproduction dolls, has purchased original Izannah Walker dolls and had molds made of the original Izannah Walker dolls' faces. She is using these molds to make copies of the original Izannah Walker dolls she has purchased. The mold-making process takes an impression of the original doll in its worn state, right down to the ridges of the stockinette in the original dolls and any wear spots on the face. After Kathy makes the head from the mold, she paints the copy of the head and shoulders so that it resembles the original doll. Kathy makes the bodies to closely follow the lines of the specific bodies she has purchased. I think it's big news in the Izannah world that someone has been able to do this. Of course, Kathy signs the works to distinguish them from original Izannah Walker dolls. To read more about Kathy's process, visit her site called Babes from the Woods. It has been my facination with old Izannah Walker dolls that prompted me to buy 2 recently and to take a mold off of my first one and reproducer her, faults, love rubs and all. The Izannah Cronicles has been a wonderful place to go to and study the wonderful examples of old Izannahs that have stood the test of time and been loved and enjoyed for so many years. If only they could talk! Not sure how i feel about it either Susie. Do your originals have jointed elbow like this Kathy? Who owns the rights/licensing etc to the original Izannah image? I think items are in public domain from the 1800's. So noone owns the right to Izannah's style/image. Is that what you mean, Robin? Thanks Dixie. I was curious, because I know the United States Postal Service was producing collector Izannah postage stamps, and from these made limited edition Izannah dolls (which I think were awful). Thought perhaps they held licensing rights. oh my gosh. I just now saw this post. Wow. Kathy, your doll is an incredible likeness. At first, I wasn't sure about it...but I quickly changed my mind. I was probably just jealous - I would love to make a doll like that - only not from a mold because I really love to sculpt. But I'm glad that someone has taken a mold of an original face and I wish that it were possible to do it for other original Izannahs, as long as it doesn't harm the original, of course. Your doll is kind of like a photo face doll, except in 3-D! 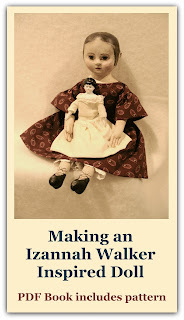 I recently became an owner of a reproduction Izannah Walker doll by Kathy Patterson that I have named Sarah Sidney. The craftsmanship of her doll is amazing. 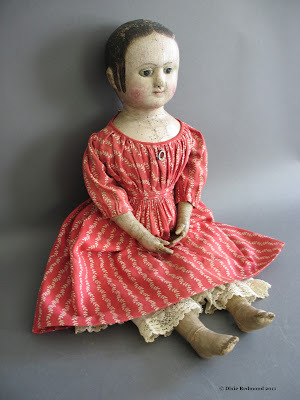 Although I would love to own an original Izannah Walker doll, Kathy's doll is amazing to look at and a wonderful addition to my collection of reproduction Izannah Walker dolls. Oh she's beautiful, great IW doll!! !